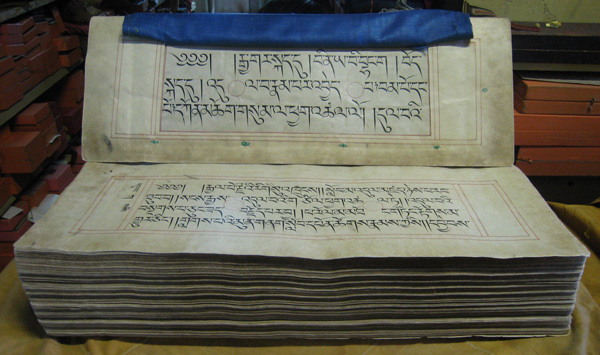 The Tempangma manuscript of the Kangyur held at the National Library of Mongolia is written on Tibetan paper with black ink. The folio size is approximately 27.8 inch x 9.8 inch (70.5 cm. x 25.0 cm). Included in this digital edition are 111 out of 114 volumes, with 3 volumes missing (040 rgyad_stong ka, 041 shes_phyin sna_tshogs, and 056 mdo_sde ga). 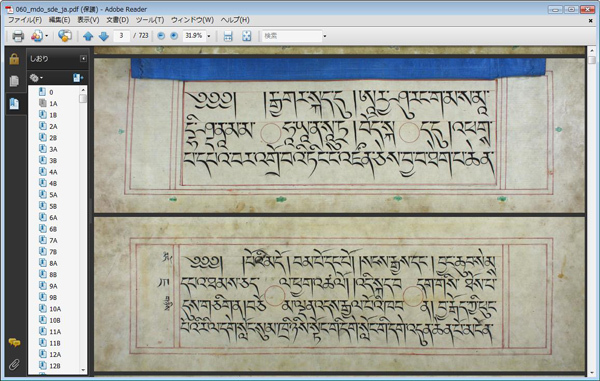 Also included is an incomplete catalog (dkar chags) that was written much later than the original text. Approximate size of the page: 27 inch x 8.5 inch (68.58 cm x 21.59 cm). Each page is bookmarked and the edges are trimmed. Incomplete catalog (dkar chags) that was written much later than the original text is also included. Copyright (c) 2016 Digital Preservation Society. All Rights Reserved.